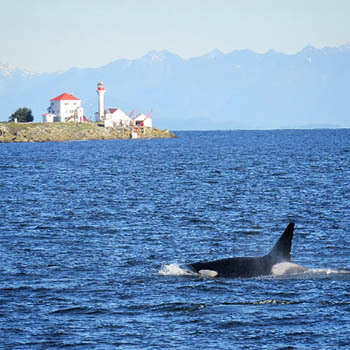 One of the best whale watching areas in North America is the British Columbia coast and frequent visitors in the waters around Gabriola are the Orca (orcinus orca). Commonly referred to as killer whales, Orcas are actually not whales but members of the Dolphin family and are the largest Dolphin in the world.Orcas are found in every ocean around the planet, from the cold polar seas to the warm tropical waters near the equator. They are the top marine predator and feed on fish, seals, other cetaceans, dugongs, sea turtles and sea birds. Their appearance is striking with jet-black bodies, white lower jaws and undersides, white patches behind the eyes. The dorsal fin is tall and triangular and in older males can be almost 2 M in height. This sets the Orca apart from other whales or dolphins. 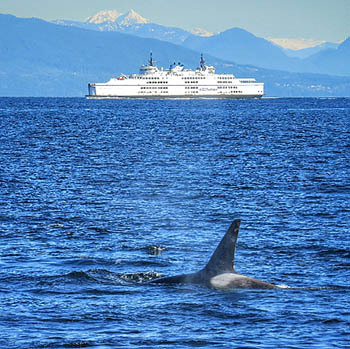 Behind the dorsal fin is a grey or purplish saddle, which is unique and identifies individual orcas to researchers. The pectoral fins are large and rounded and act as paddles when the orca swims. RESIDENTS are the most commonly sighted live in cohesive, complex family groups, are very vocal with one another, live in pods of up to 25 individuals and travel more predictable routes. TRANSIENTS travel unpredictable and varied routes sometimes not visiting the same place twice. They have smaller pods of 2 to 7 individuals. They are larger than resident orcas and have taller more pronounced dorsal fins. OFFSHORE live in very large groups up to 60 or more individuals. They live far out in the open ocean and more study is underway to learn about their habits. For their size Orcas are extremely acrobatic. They are often seen: ” breaching”,” lob tailing”, “spy hopping” speed swimming or porpoising. They like to rub their bodies on rounded pebbles or stones on shallow beaches. They communicate with one another by distinctive cries, squeals, clicks and whistles. In the wild males can reach the age of thirty-five with females living to age fifty. Female Orcas are usually fifteen years old when they become mothers. Fall and winter appears to be the peak calving season after a gestation period of 12 to 16 months. The calf weighs in around 180kgs and is about 2.4m in length. The mothers rich milk sustains the calf for up to two years but usually they begin feeding on their own at about 12 months. The whole pod cares for the young. First Nations peoples have honoured the Orcas through their art, spirituality, religion and stories handed down to each generation. Some mythology sees the Orca as the embodiment of the spirits of deceased chiefs. Orcas are highly intelligent, social mammals like us. They are listed on The Species At Risk Act (SARA) especially the Resident population due to pollution (PCB’S), noise (one of the busiest waterways) and lack of fish mainly salmon. In the 60’s and 70’s many Orca were captured, taken from their families and sold to aquariums around the world. Although much was learned from earlier captive orcas, putting them on display, forcing them to continually perform, keeping them in small pools so foreign to the ocean they were removed from is now viewed as cruel and inhumane. Often adults and offspring have died a sad and lonely death. A new and powerful documentary BLACKFISH tells the real story of Orcas in captivity and the tragic consequences. These magnificent Orcas represent a powerful and evocative symbol of freedom. We, as the Keepers of the Planet have a responsibility to educate ourselves to find ways to bring about a healthier and oil-free ocean. 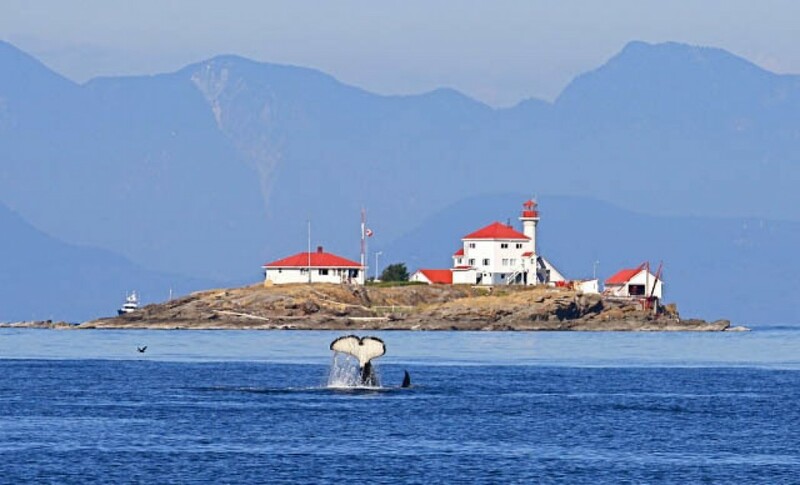 BC Cetacean Sightings Network (BCCSN) –Sighting Hotline 1-866-I SAW ONE (1-866-472-9663) any sightings of live whales, dolphins porpoises, sea turtles.